Management was amazingly helpful, the property was stunning, location was beautiful, food was delicious and honestly, I wish I could move here! 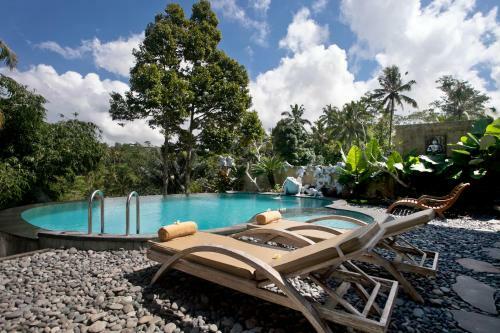 Located very close to the Tegalalang rice terraces! Excellent customer service, very friendly and helpful. Great views of a small clean rice terrace. 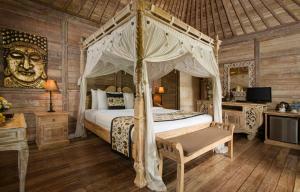 Clean and tastefully decorated accommodation which emphasizes on Balinese art and culture. Villas nice and clean, great activities available, amazing views. - Staff had a good command of English and were always ready to help. - Room was clean, bed was comfortable and TV had a good selection of channels. - Free shuttle services to and fro Ubud. - Free morning walk on alternate days that offered great insights into Sebatu village and Balinese culture. The breakfast was great, our villa with pool was very authentic, cosy and had a nice rice terrace/jungle view. Beautiful garden. The reception staff was very helpful. Great value for money. Awesome views of the rice terraces. The property was so green and prosperous. 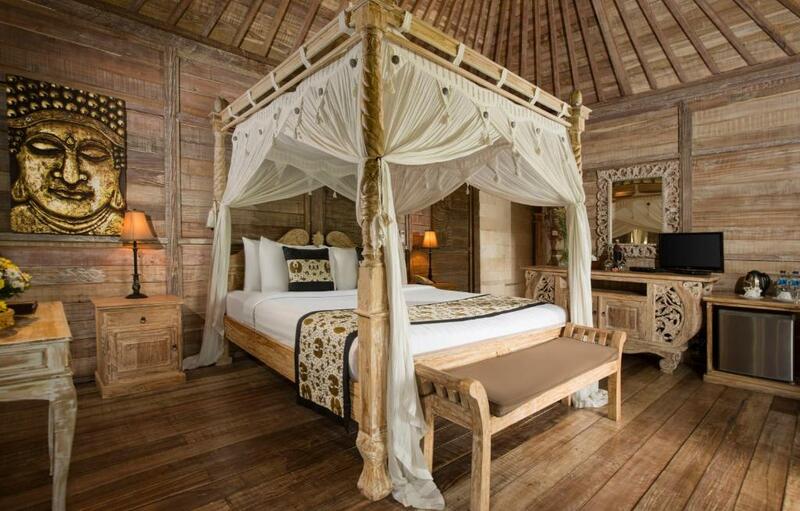 Lock in a great price for Pondok Sebatu Villa – rated 9.1 by recent guests! 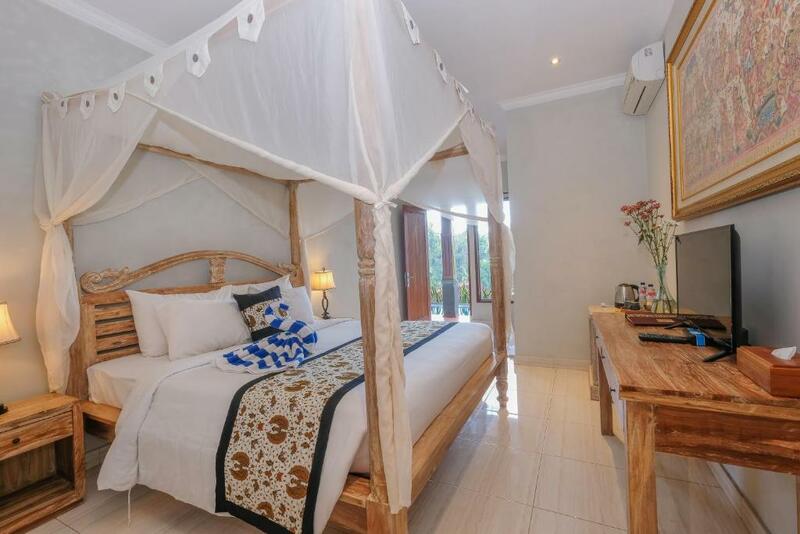 Pondok Sebatu Villa This rating is a reflection of how the property compares to the industry standard when it comes to price, facilities and services available. It's based on a self-evaluation by the property. Use this rating to help choose your stay! Featuring an outdoor swimming pool, Balinese-style Pondok Sebatu Villa provides free shuttle services to Ubud and free Wi-Fi throughout the villa. Sebatu Temple is a 5 minutes' walk away. Guests who drive can enjoy free parking privileges. Overlooking the gardens, the green valley and rice fields, the air-conditioned rooms are fitted with a cable TV, mosquito net and a balcony with seating area. The private semi open bathroom comes with shower facilities. Some villa offers private swimming pool. Pondok Sebatu Villa is 5 minutes’ drive from the beautiful rice paddy fields of Tegalalang, while it is 15 minutes’ drive to central Ubud. Guests may request for in-house massage treatments and laundry services at additional charges. Pondok Restaurant serves Indonesian and Western dishes on site. When would you like to stay at Pondok Sebatu Villa? This air conditioned villa features a private pool and terrace. Fitted with a flat-screen satellite TV and a DVD player. Private bathroom comes with a shower, bath tub and free toiletries. This air conditioned villa has a balcony, private pool and a terrace. Fitted with a flat-screen satellite TV, DVD player and an iPod dock. Private bathroom comes with a shower, bathtub and free toiletries. This air conditioned villa has a private pool, telephone and terrace. Also has a mosquito net and mini-bar. Private bathroom comes with a shower, hairdryer and free toiletries. 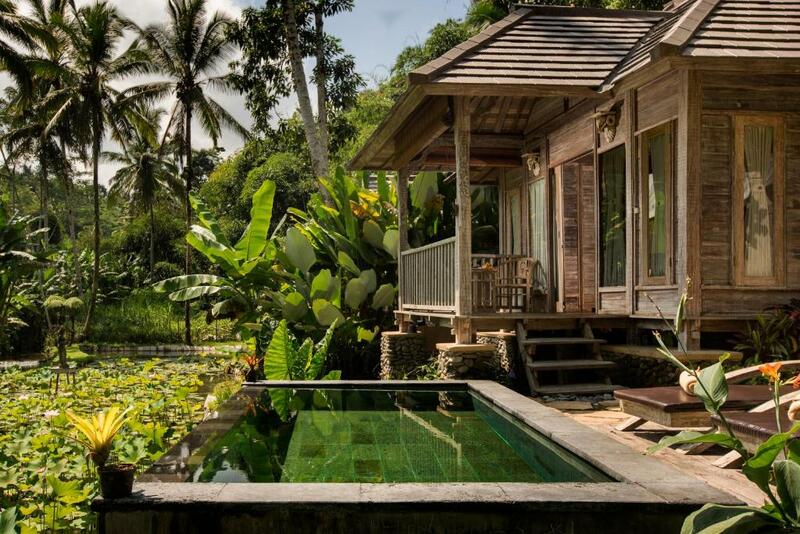 Made from recycled wooden house, this suite offers a private pool. This suite features a balcony, mini-bar and hot tub. This suite has a balcony, flat-screen TV and private pool. 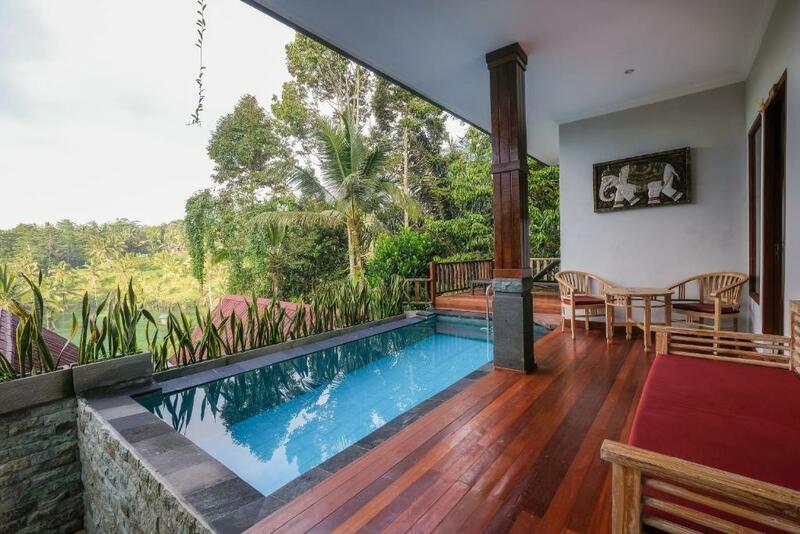 Pondok Sebatu Villas is small property located in Sebatu village approximately 20 minutes drive from Ubud central. The location is in the middle of the rice field facing to valley for rice field. A perfect place for honeymoon or family holiday. We build the property from old used timber and also using a in house water spring for hotel and guest use. With this we believe we can be one of eco friendly resort. 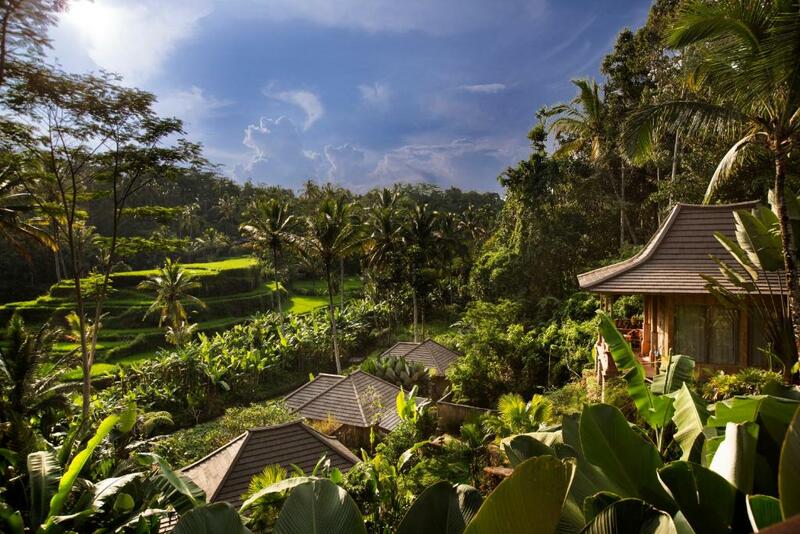 The villas also located only 10 minutes drive from famous Tegalalang rice terrace, 25 minutes from Kintamani and 10 minutes from famous holy spring tampak siring. I am the Owner of the property and glad to offer you our best service and quality of our product. House Rules Pondok Sebatu Villa takes special requests – add in the next step! All children under 12 years are charged IDR 750000 per night for extra beds. Any additional older children or adults are charged IDR 750000 per night for extra beds. Pondok Sebatu Villa accepts these cards and reserves the right to temporarily hold an amount prior to arrival. Please inform Pondok Sebatu Villa of your expected arrival time in advance. You can use the Special Requests box when booking, or contact the property directly using the contact details in your confirmation. Not all the staff speak English. This causes problems when ordering food and you have food allergies, even though the waiter repeated after me to exclude peanuts from my dish and when bringing me food I asked once more if it's peanut-free (to what I received a confirmation from the waiter) the dish was still WITH peanuts. (We were a group of 8 and everyone heard our exchange, there shouldn't have been any misunderstandings). Furthermore, I ordered the same breakfast for two mornings but it differed, even though the only difference was that I changed scrambled eggs to omelette, the rest on the plate should have stayed the same (according to the menu). A friend of mine ordered food that was delivered without some of the ingredients and not once did anyone come and ask if that's fine or maybe she would like to change her order (as done in other places we have been to). Also, the stairs IMHO are not suited for seniors or people with short legs. ( I'm the latter) The steps are high. The view from our suit towards the rice terraces. Breakfast choices were limited, food was ok, wish there was a money changer at the location since there wasnt one closeby. Friendly staff, rooms were comfortable, facilities were clean. 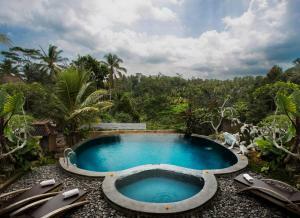 The hotel is located in the mid of the rice field, 20 min drive to Ubud center. Very quiet and nature. The staffs are very helpful! We were stopped by the heavy rain in the temple nearby, and the staff quickly drive to pick us up for free! Food can be improved a bit, such as the banana chocolate roll for Christmas dinner. It could’ve tasted better if chilled. Like everything during my stay. Though our initial 3bedroom villa had been changed to 2 bedroom and 1 bedroom villa separately, but we were quite happy since both villa got private pool and the furnitures were newer and well maintained. Used the shuttle service to Ubud central and had 2 breakfasts and 2 dinner at their restaurant. Staff was very friendly and helpful. I needed something urgently and they went out to nearby village shop to buy for me. All in all, a very pleasant stay. We enjoyed the Bali dance by local kids in Christmas Eve and definitely impressed by the festive decoration in the village. Lucky we got the chance to jalan jalan. The property itself it is amazing. Relax, quiet, greenish. Excellent beautiful view, comfort room. Totally amazing location!! Wonderful staff, lovely room, great bed, lovely breakfast. Pillow was very thick! Not the worst problem to have! My only concern about the property was that the road leading up to it was not the best condition, but that’s not really the property’s fault. I had read online that the rooms smelled stagnant and humid, but thought that we would give it a shot anyways. It turned out that it was so humid that everything was soggy, right down to the sheets on the bed. My computer actually stopped working because it was so moist!! The food was half decent in taste, but two of our 4 guests got Bali Belly here. Private pool was freezing cold. Private Pool wasn’t very useful. No where to sit and very cold. The panoramic view, the hotel is in front of the some rice terraces. The staff is very friendly, the food was very tasty. The room was amazing. The location is strategy for one day tour, and it’s possible to hire private driver for one or more days. Our driver’s name was WI and we recommend him. No major dislikes. Accommodation is on the pricier end. The gardens were outstanding. The restored cottages gorgeous. Try and get a treatment...the spa area is very special. 1. The way to the hotel is very long from Ubud, the road is very steep and in a bad condition. 2. We arrived around 11 pm and were met by security guard who just helped us to bring bags to the room (2 bedroom villa with private pool) and was not able to tell us about the facilities. Nobody was at the reception. 3. During the booking I requested double beds in each of the bedrooms, and the hotel confirmed it. But when we arrived we saw two single beds in one of the bedrooms. We had to ask security guard to at least move the beds to each other. 4. The rooms are quite outdated. Bedsheets were wet and grey. Fridge is noisy so I had to turn it off to have some sleep. The bed cover is dirty. Pool towels were dirty and smelly. 5. The bathroom has small windows without any glass or cover, so insects and lizards could easily enter there. Towels are very very old, grey and had few holes. 6. The breakfast menu is quite extensive, but the taste and quality of food are not good. Pastry looked like frozen and heated, definitely not fresh. Overall the hotel is way outdated and not properly maintained. I must say the staff is good and helpful, and this is not their fault, but the owner and manager definitely should take more care about the property. The reception staff is very polite and helpful, and the surroundings (rice terraces and palm trees) are beautiful. To my regret these are the only positive impressions we had there.